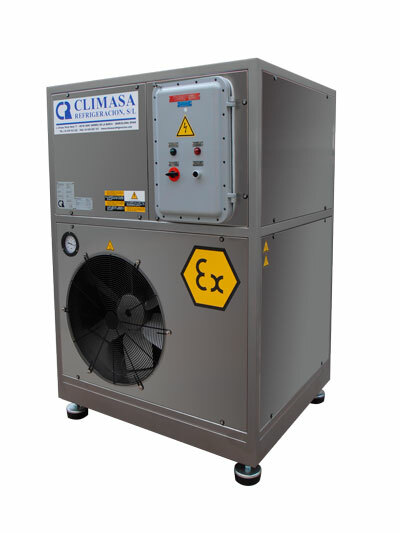 The CREA chillers are located in explosion proof areas or hazardous zones. One of its most common uses is the conditioning coolant for process control in chemical and petrochemical plants. They are also used in graphic arts companies for cooling print machinery. Suitable in extreme weather conditions. Withstand fluctuations in the power supply. 3 ~ (380-420 50Hz / 60Hz 440-480) without neutral. Available powers from 3 to 7 KW. Flameproof motors according to ATEX directive 94/9/EC. 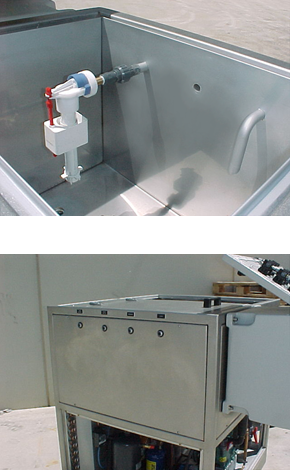 Stainless steel accessible structure easy to maintain. Water pump on stainless steel. Stainless steel heat exchanger built with high efficiency plates. Thermal load and fluid flow calculation. User manual, installation, security and maintenance. External equipment with remote control panel. Units on two parts, split type. Custom equipment installation as required. Air exchangers with anticorrosive treatment: Lacquered, Blygold, Heresite. Liqud separator with heat exchange. Oil separator with return to the compressor. Water condensation system with constant pressure valve. Customized input and output signals. 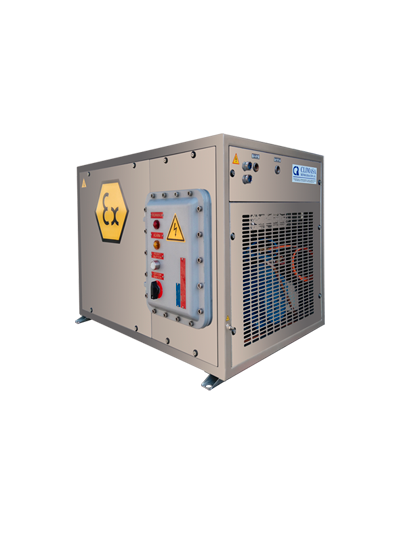 Available powers from 7 to 100KW. Automatic start for the standby pump. Other constructive versions available on request. Two water pumps ensure the circulation of coolant. The control actives the pumps cyclically and with standby function. 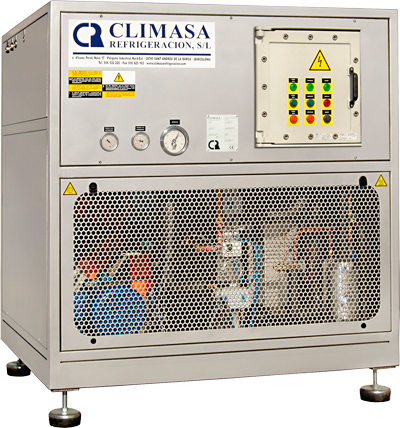 We have chillers with negative temperatures for the liquid circuit. An antifreeze fluid prevents freezing and allows operation of the system. The series CREA allows modification of their systems to use the heat extracted for other purposes.